OAKLAND, California – With the Lunar New Year approaching, free food, bicycles and a community mural painting are some of the ways that Asian Pacific American health groups are attracting families to promote healthy living, including a tobacco-free environment. 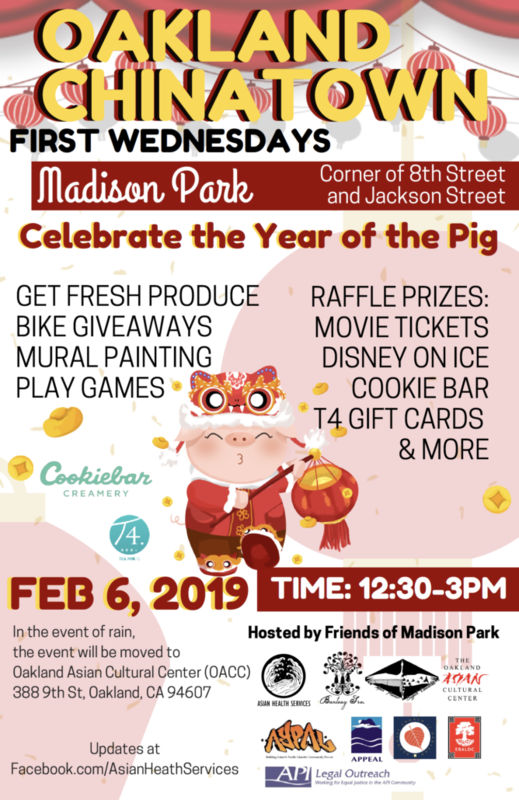 On February 6, a coalition of local Oakland organizations called Friends of Madison Park is hosting a “Celebrate the Year of the Pig” event expected to draw up to 200 children, youth and their parents from 12:30 to 3 p.m. The free event is part of Oakland Chinatown First Wednesdays, a monthly activity held in Oakland’s Madison Park at the corner of 8th and Jackson streets. Among the alarming facts are studies that show a prevalence of tobacco use with Asian Americans and Pacific Islanders in California and a recent public health advisory by U.S. Surgeon General Jerome Adams on the e-cigarette epidemic among youth. In the Asian American Pacific Islander community, smoking prevalence in the state is highest among Korean American men and women, Vietnamese American men, and Native Hawaiian/Pacific Islanders. One typical e-cigarette, often packaged with designs alluring to kids and teens, contains about as much nicotine as a pack of 20 regular cigarettes. The Lunar New Year, a family tradition, provides an opportunity to celebrate that good fortune can come from good health. Red envelopes from the Asian Smokers’ Quitline with their information will be distributed by the groups while they give away fresh produce in partnership with the the Alameda County Community Food Bank, restored bicycles, and raffle prizes. As part of the education about the ills of e-cigarettes, Asian Health Services is organizing a colorful mural painting activity for youth to appreciate clean air and breathing freely and to share that message among their peers.